Oh, lunar majesty of near-earth orbit, why doth your shine provoke lack of doubt? Awake you keep the owl and wombat, all the while a secret kept, through the blackness ever soaring, only leaving in the morning (usually). Yet over time you seem to morph from something trim to a healthy girth. Early man discovered the secret and since there was no way to keep it we charted your path and labeled your phases until we sang our own self praises for locking down a piece of the skies with just our mind, our thoughts, and eyes. Hmm, waxing poetically about moon phases (see what I did there? The moon waxes and wanes during its phases. Science pun. Never mind.) has gotten me excited to take a trip through certain “phases” of engineering excellence to discuss the most accurate moon phase complications in a wristwatch today. While this might not actually be a definitive list (there really are a lot of watches out there so please leave a comment if you think that I missed one), and a piece from yesteryear that we don’t know about might be more accurate – though probably not worn on the wrist – I’m guessing that at least the top four spots are . . . spot on. Okay, seriously, I just can’t stop sometimes. When it comes to moon phases, the time it takes to go from full moon to full moon is 29.5 days. Its actual synodic time is 29 ½ days, 12 hours, 44 minutes, and 2.9 seconds. Astronomy nerd side-note: the moon has multiple defined periods for a lunar month, including sidereal, synodic, tropical, anomalistic, and draconic. The two that really matter to most people are sidereal and synodic. The sidereal month, which is used by astronomers, is the length of time it takes for the moon to return to the same position against an average of background stars. What matters for us watch nerds is the synodic interpretation, which is basically the phases as they relate to the relative alignment with the sun and earth. The average for the synodic month is 29.530587981 days. This will be important later (so please memorize this number). The standard accuracy for a wristwatch’s synodic month (moon phase period) is generated by a gear wheel featuring 59 teeth (it advances by one tooth per day), which nets you a little over two and a half years of accuracy before the indication is off by one full day. That’s not too shabby, but if you think of that in an equivalent error in rate for timekeeping in a C.O.S.C.-rated watch, this amount of “accuracy” would mean the timepiece would gain one minute and 34.6 seconds per day. We wouldn’t accept that. So the next step was for watchmakers to make a system with a finer-toothed gear, boasting 135 teeth to be exact. With this new, more precise moon phase mechanism, many higher end watches have been able to bump that 2.5-year accuracy up to 122.5 years. Now, that is something serious. I don’t know about you, but that is longer than I expect to be alive and to care about the accuracy of the moon phase watch on my wrist. But, as with anything, accuracy is relative and some people wanted more . . . much more. So super-accurate moon phase complications were developed. Here is a rundown of the 8 most accurate moon phase watches available today. One for each day of the week, and an extra for good measure! The H. Moser & Cie Endevour Moon starts out the super-accurate moon phase complications at a very stout accuracy of 1,027 years of service before needing to be adjusted by one day. The feat was accomplished by calculating a gear train using an average period of 29.53059 days, using three more significant figures than “precise” moon phases and adding almost an entire millennia to the life of its accuracy. A little-known fact is that independent watchmaker Andreas Strehler was involved in the design of this particular movement, which Elizabeth has written about in H. Moser & Cie. Endeavour Perpetual Calendar On The Wrist. Way to get the category rolling, H. Moser & Cie! For more information, please visit www.h-moser.com/en/collection/endeavour-perpetual-moon-1348-0100-blue-fume. Next on the list is the formidable Saxon brand known for other amazing creations such as the Zeitwerk Minute Repeater and the Lange Double Split. Lange pushed the envelope with the Terraluna, using a slightly different calculation for the gear ratios than Moser to achieve an accuracy of 1,058 years. The moon also completes an orbit around a rotating earth visible on the back of the watch thanks to a planetary gear system. Even more surprisingly, that wasn’t a pun. This watch was a winner at the 2014 edition of the Grand Prix d’Horlogerie de Genève in the calendar category, the same edition during which Walter Lange won the Special Jury Prize. You can learn about it in the context of its introduction by reading Give Me Five! Perpetual Calendars From SIHH 2014 and in the context of the 2014 Grand Prix d’Horlogerie de Genève by reading Reflections On The 2014 Grand Prix d’Horlogerie de Genève. At number six we meet a living legend in the Patek Philippe Sky Moon Tourbillon. Seriously, this watch is epic by any definition (including price). But what is more epic is that the celestial display on the back was developed by calculating 25 trillion (25,000,000,000,000) gear train ratio variations searching for the best possible combination for all of the indications involved. The final ratios chosen resulted in a moon phase that loses 6.51 seconds every synodic month. In more relative terms, that means the moon phase will be one day behind every 1,073.06 years (if my math is correct). You can read more about the newest version of the Sky Moon Tourbillon in The Patek Philippe Sky Moon Tourbillon Earns A Place In Horological History. 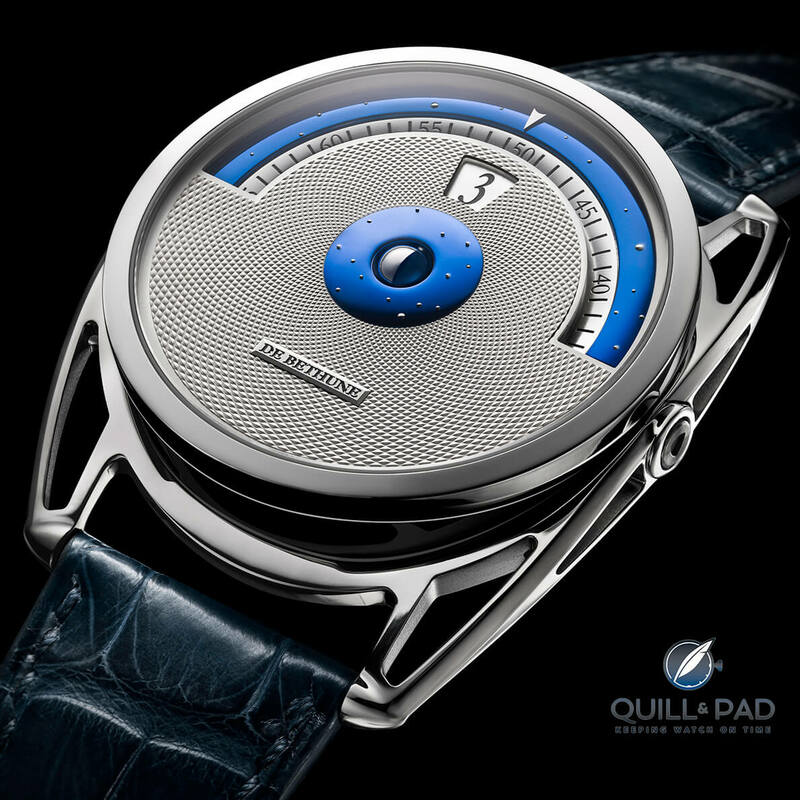 Entering the top five, we come to one of my favorite brands and definitely a favorite watch of mine: the De Bethune DB28 Digitale. This watch makes my heart melt with lust, and it would make my wallet melt, too. But regardless of all that, it takes its job as a precision instrument seriously. The tiny half-polished, half-blued spherical moon rotates so accurately that it is also the one that comes closest to adding a full one thousand years in accuracy. This piece will only be off by one full day every 1,112 years. Geez. 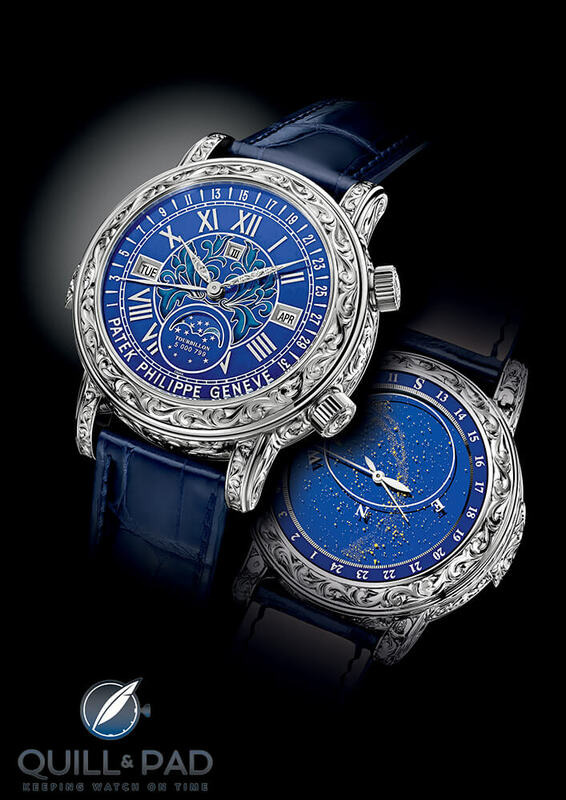 For more information, please read The Nine Muses And The De Bethune DB28 Digitale. With number four, though, the entire game shifts into overdrive and we enter the super-duper-precision moon phase complication category. The Ochs und Junior Moon Phase does that shift with a tiny amount of parts, five to be exact. With those five parts, which make up an epicyclic gear train, moon phase accuracy more than triples that of the De Bethune DB28 Digitale listed at number 5 in this countdown. Calculating the synodic month with the ratios on the gear train, Ochs und Junior obtains a period of 29.5306122449 days. This means that to be off by one day it will take in incredible 3,478.27 years. Holy moly. For more information on this timepiece, please visit www.ochsundjunior.ch/watches/moon-phase. The Ochs und Junior is hot on the heels of the number 3 watch in this listing, which also happens to be one of my absolute favorite Jaeger-LeCoultre timepieces. The Duomètre Sphérotourbillon Moon is one fantastic watch, and it also has a moon phase boasting accuracy almost 12 percent longer than the next best. The Duomètre Sphérotourbillon Moon will only be one full day off after a whopping 3,887 years! For more information, please see Precession Obsession: Jaeger-LeCoultre Duomètre Sphérotourbillon Moon. You know how I just said we entered the category of super-duper-precision moon phase watches? Yeah, well now we’ve left that and entered the ultra-precision category. And I mean it. Long known as the king of astronomical watches, Christiaan Van der Klaauw took no prisoners when designing the mechanism for the Real Moon Joure. With an ultra-realistic, three-dimensionally shaped moon, this watch will only be off by one day after . . . are you ready for this? . . . 11,000 years! For more information, please visit www.klaauw.com/eng/cvdk-real-moon-joure. Wait a minute, number 1 . . . B? Please hold on to your knickers for a moment. 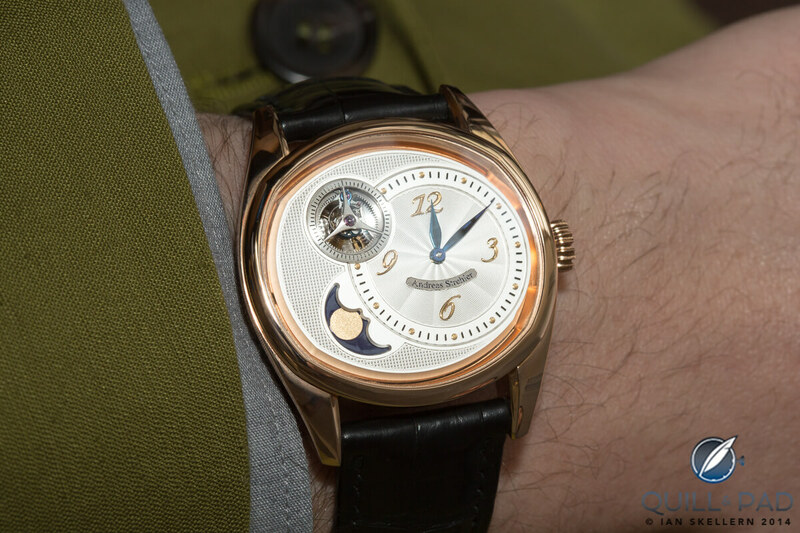 Andreas Strehler released the Sauterelle à Lune Perpétuelle at Baselworld 2014 and in doing so created the watch with the most accurate moon phase ever. And he used only four extra components. Yikes! It was a serious feat owing to the fact that the moon phase is being constantly driven. The moon phase utilizes internal and external gear teeth. And Strehler employed prime numbers for the teeth, creating very complex fractions and an accuracy bordering on insanity. It will take 14,189.5383 years for the moon phase to be off by just one day. And now I present . . . 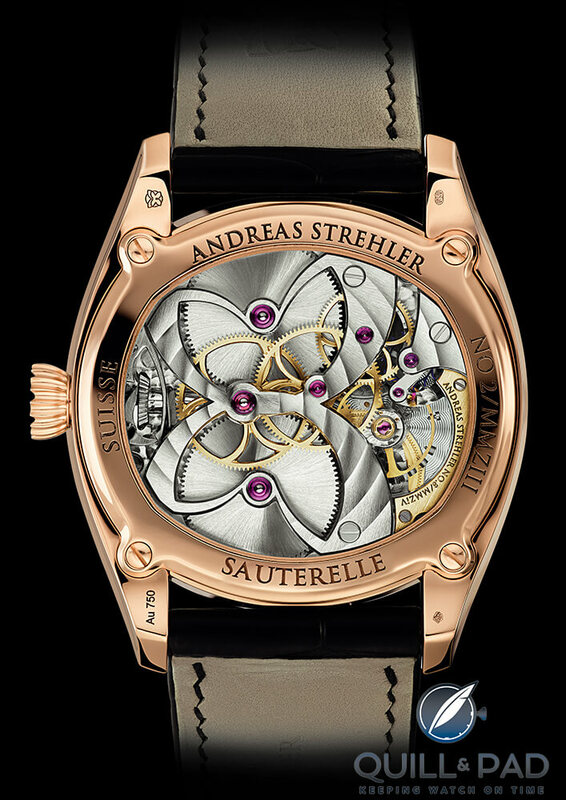 The Andreas Strehler Sauterelle à Lune Perpétuelle 2M! Just wait, the story gets better. As Strehler presented his watch at Baselworld 2014, he also mentioned how he had written a computer program to calculate the gear teeth ratios to achieve the best accuracy he could. As a side note, he mentioned that he actually had another ratio that was far more accurate than the one in the Sauterelle à Lune Perpétuelle, but it seemed almost crazy and overkill to put it into a watch. A couple months later he did just that. Utilizing the same number of parts and simply changing the ratios and number of teeth, Strehler was able to shatter the previous record and move into his own category: fundamentally perfect. This new version of the watch has a moon phase 145 times more accurate than its own predecessor. The Sauterelle à Lune Perpétuelle 2M will be off by one single day after, get this, 2,060,757 years. That’s not a typo: 2.06 million years! This is such a long amount of time that the moon phase can be considered perfect, because by the time you would need to adjust it by one day, the rotational period of the earth, and the moon, and the relative orbits of both will have changed by such a degree that, because the moon is gradually moving away from the earth, our days will be about 36 seconds longer than they are now and every calculation will be null and void for multiple reasons. So, basically, this is a perfect moon phase watch. It can’t be made any more perfect for the simple reason that the numbers involved in calculating it will change in less time than it requires adjusting the moon phase by a single day to be in sync again. If moon phases interest you — and the chances are that if you have made it this far, then they do — you will probably love the moon phase app developed by Finnish independent watchmaker Stepan Sarpaneva, which is available free on the app store on iTunes at itunes.apple.com/us/app/sarpaneva-moon. 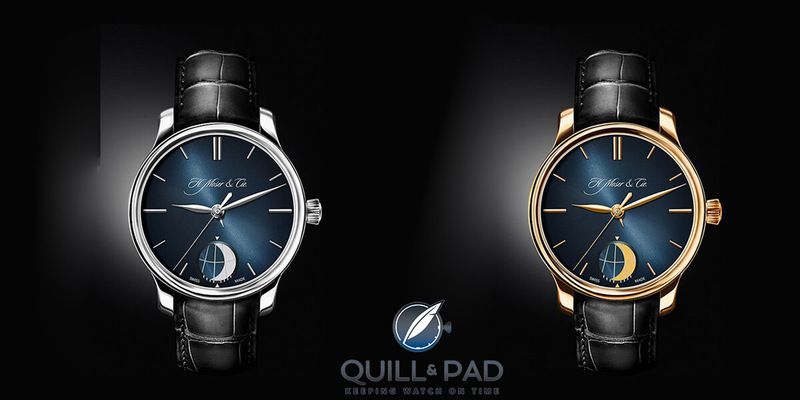 *This article was first published on Quill & Pad on July 5, 2015 at The 8 Most Accurate Moon Phase Wristwatches Today. You may find the comments under the original article interesting. 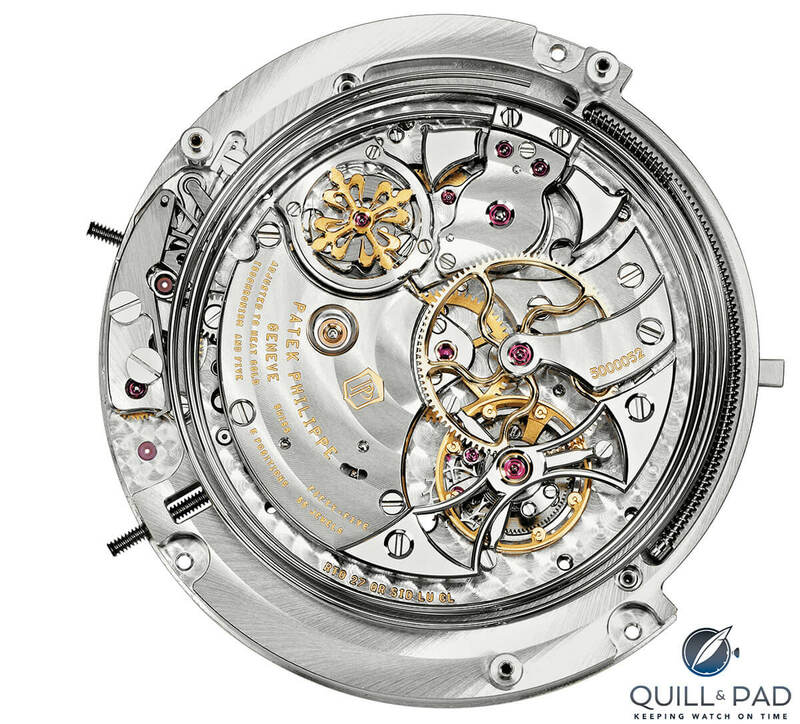 A marvel but it’s one of the most usless complications, IMO, along with the Tourbillon. I know that will annoy countless people but I love GMT watches and Seiko & others can build watches accurate to less than a second a day. More than accurate without the cost of the Tourbillon. Wow, the most accurate one is amazing. For it to be “perfect,” though, shouldn’t it account for that 36 second increase in the length of a day 2m years from now? LOL. These watches are not only stylish but we love amount of complexity that goes into creating these time pieces!